The Dallas Stars head to Xcel Energy Center to take on the Minnesota Wild on Saturday, September 30, 2017. The opening line for this contest has the Stars at -110 and the Wild at -115. Dallas had a record of 34-37-11 last year and away from home they had a record of 12-24-5. They were 6th in the Central Division. They tallied 223 goals and surrendered 262 goals for a point differential of -39. For the year they had an ATS mark of 34-48-0 and an over/under record of 43-39-0. Minnesota finished with a record of 49-25-8 including 27-12-2 on home ice last year. They were 2nd in the Central Division. They scored 266 goals and gave up 208 for a goal differential of +58. Their record against the spread was 50-37-0 while their over/under mark was 43-35-0. Ben Bishop had 18 wins and 15 losses last season in goal for the Stars. He had 1,040 shots against him and he surrendered 94 goals. He made 946 stops for a save percentage of 91%. Jamie Benn scored 68 total points last year for the Stars. He had 25 goals last season with 196 shots on net giving him a shooting percentage of 13%. He had a total of 43 assists on the year and averaged 19.4 minutes played per contest. Tyler Seguin averaged 18.5 minutes of ice time per game last season. In that time he had a shooting percentage of 9% by tallying 25 goals on 294 attempts. He had 45 assists giving him a total of 70 points on the year. Eric Staal had 64 total points last season for the Wild. He had 27 goals last year with 209 shots on goal giving him a shooting percentage of 13%. He had a total of 37 assists on the year and averaged 18.6 minutes played per contest. 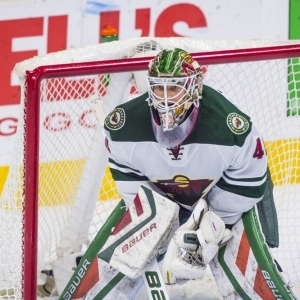 Devan Dubnyk had 40 wins and 19 losses last season in net for the Wild. He had 1,842 shots against him and he gave up 141 goals. He made 1,701 saves for a save percentage of 92%. Mikael Granlund averaged 18.8 minutes of ice time per contest. In that time he had a shooting percentage of 15% by scoring 26 goals on 177 attempts. He had 43 assists giving him a total of 69 points on the year. The Stars gave up 249 power play opportunities and surrendered 65 goals on those chances for a penalty kill percentage of 74% last season. That was 30th in the league. They averaged 31 shots per contest and as a team shot 8.90% for the year. They allowed 30 shot attempts to their opposition per game and had a team save percentage of 89%, ranking them 30th in the NHL at stopping the puck. The Stars were 24th overall with 79 total points last year. They were 18th in the league with 223 goals and 2nd in goals allowed with 262. They had 257 power play chances and scored 46 goals on those opportunities for a percentage of 18%. That was 20th in the NHL. As a team, the Wild were 2nd with a total of 266 goals scored while they were 24th with 208 goals surrendered last season. They averaged 31 shots per game and had a team shooting percentage of 10.53%. As a unit they gave up 30 shots per contest and had a save percentage of 92%, putting them 7th in the league. The Wild had a total of 106 points last season, which was 5th in the NHL. They had 47 power play goals on 224 chances for a percentage of 21%. That was 9th overall. They gave up 217 power play opportunities and surrendered 37 goals on those chances for a penalty kill percentage of 83%, ranking 8th when short-handed. Dallas was 15th in the NHL in Corsi percentage last year with 50.4%, as they attempted 4,890 shots on net at full strength while they gave up 4,821 shots on net in the same situations. Their Fenwick percentage was 50.9% as they had 3,613 attempts while they gave up 3,491 shots on the defensive end. That ranked them 7th in the league. The Stars started possessions in the offensive zone 48.6% of the time, which was 25th in the league, while their defensive zone percentage was at 51.4% for the season. That was 8th overall in the NHL. They had 2,551 face-off wins compared to 2,560 losses, meaning their face-off win percentage was 49.9%. That ranked them 13th in the league. On defense Dallas had 1,552 hits and they blocked 1,330 shots from the opposition, putting them 4th overall. Minnesota had a Corsi percentage of 49.8% as they tried 4,566 shots on goal while at full strength while they surrendered 4,604 shots on net when they had a full team on the ice. That ranked them 17th in Corsi percentage. They were 17th in the NHL in Fenwick percentage with 50% as they had 3,444 shots while they gave up 3,443 attempts on defense. The Wild started possessions in the offensive zone 50.5% of the time while their defensive zone percentage was at 49.5% for the year. That put them 13th and 11th in the league in zone percentages respectively. They had 2,550 face-off wins as opposed to 2,359 losses, meaning their face-off win percentage was 51.9%. That was 6th overall in the NHL. On defense Minnesota had 1,284 hits and they blocked 1,161 attempts from opposing offenses, which was 15th in the league.